Que, here is my list of some HIP recordings, which are played in HIP style on properly restored Northern or German baroque organs. and which do not constitute parts of complete cycles. The number of candidates is small, - almost all uncompromising HIP recordings are parts of integral recordings. Ton Koopman 6 CD set for Novalis (already recommended by Que). 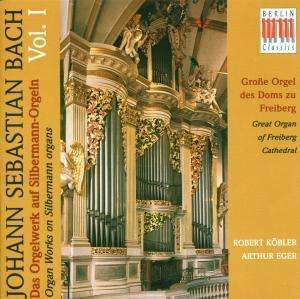 Rainer Oster 1 CD for Arte Nova on the Schnitger organ of Sc.Jacobi, Hamburg, (Arte Nova 74321 63644 2). Stefan Johannes Bleicher 2 CDs for EBS on the Gabler organ in Weigarten and the Holzhey organ in Weissenau respectively. On the same Holzhey organ he also recorded a Bach-CD for Arte Nova. 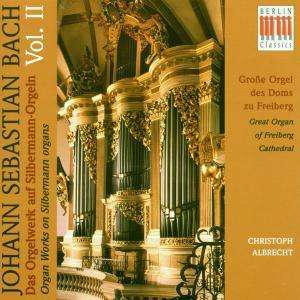 Franz Raml 1 CD for Oehms on the Silbermann organ in the Church of the Court, Dresden. Jean-Charles Ablitzer 2 CDs for Harmonic Records, France on the Treutmann organ, Goslar-Grauhof. Hubert Meister 1 CD for Motette on the Silbermann organs in Grosshartmannsdorf and Forchheim (contains the triosonates). Matthias Eisenberg and Felix Friedrich 1 CD each (sold as double midprice set) for Capriccio on the Trost organ in Altenburg. Robert Clark 2 CDs for Calcante on the Hildebrand organ in Naumburg. Rene Saorgin on French Harmonia Mundi. Edgar Krapp for Berlin Classics on the Wagner organs in Brandenburg and Treuenbrietzen. Felix Friedrich for Motette on the Trost organ in Altenburg. The CDs of some of the uncompromising HIP Integrals are sold separately. This is true of the Haenssler cycle, the Weinberger cycle (CPO) and the Kooiman cycle (Coronata). What's more: thanks a bundle for the list, with many items that are new to me and look very intriguing! I'm familiar with a few of the names, but I now really have my work cut out for me! I didn't know that Kooiman had recorded a cycle - seems interesting. Anyone knows this one? Comments are welcome! Yes, I have got it in my listening queue. This is the only part of Foccroulle´s integral, which is available at the moment. Didn´t mention it because I haven´t heard it yet. Just did the effort to listen to all of it. The Gottfried Silbermann organ in the Dom of Freiburg is a most spetacular instrument, and it is much used for Bach-recordings ( Alain, Rübsam, Werner Jacob, Christoph Albrecht, Hans Otto et.c.) . On this recording from 1991 the sound is very clear and present, miking at the right distance to my taste. 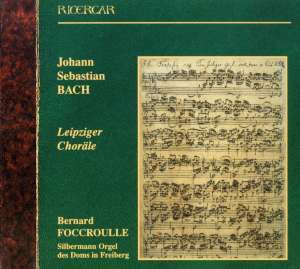 Foccroulle´s interpretation is smooth and flowing marked by a high degree of spiritual concentration, meditative when needed, and jubilant when needed. Registrations are scholary with a certain preference for sesquialtera- and cornet-like registrations, which I think, Bach would have approved. Articulation generally scholary detached if not as pointed as Kooiman´s or Weinberger´s. The 2CD-set contains the 18 Leipzigchorales (the 17 and Vor deinen Thron tret Ich) in a rather casual order (not-BWV). As fillers we also get the Canonic variations and the Preludes and Fugues in c-minor BWV 546 and C-major BWV 547. My only chritisism is, that the c-minor Prelude is a bit rushed, detracting from its momumentality despite the use of 16F in manuals and 32F in the pedal. All in all though, this set can be strongly recommended. Thought I'd share some experiences on my recent Bach organ purchases. First, I got volumes 9-16 of Weinberger's cycle on cpo. I'm very satisfied with it: good, honest and pointed playing - straight forward with no frills. I like that. 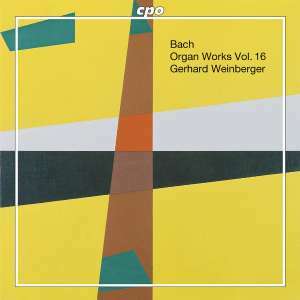 I found volume 13 with Clavier Übung less satisfactory in comparison with the rest. Listening to these recordings confirmed the importance to me of the use of period organs - they all sound beautiful, some drop dead gorgeous! If this cycle is issued as a boxed set, I will most certainly get it! My other purchase was the Clavier Übung III with Suzuki (BIS). Finally, the impression of smoothness is enhanced by the modern organ, which lacks IMO character and "grit". Of the very little number of recordings I know, my favourite recording of Clavier Übung III remains Kay Johannsen (Hänssler). Que, nice to see that you enjoy Weinbergers Bach. I have to agree with your words about his Clavierübung III - or to be more precise, some of the great chorale preludes from the collection, which are performed in a less inspiring way, than I am used to by this interpreter. I also must agree with your words about Suzukis Clavierübung III, which I find rather clinical, the sound of the rather undistinctive organ adding to that impression. Another request for your comments - anyone familiar with this series on Berlin Classics? I just downloaded a 12 cd set, it took 36 hrs. I didn't know what I was getting myself into! These things really should come with a warning. Is that the stereo recording from Walcha or the old mono? The recordings are more than 30 years old, and most of the artists are dead by now. So the style of playing is a bit oldfashioned, but not enough to bother me. The sounds of the different Gottfried Silbermann organs are utterly charming, even if the instruments generally weren´t scientifically restored - as far as I know. Detailled informations about this topic are missing in the booklets. Because of the many different participating organists the artistic level is variable, but most often very good and never less than acceptable. Recorded sound is better than could be anticipated. Goodness! Just the opposite for me. I find Johannsen a pale imitation compared to Suzuki's magnificent reading. Hope the music makes the same overwhelming impression! And what are your feelings on the recordings by Weinberger? Very favorable. Overall, I love the organs he plays and his very sharp contours. I do sometimes feel that he lacks some musicality, but nobody is wonderful throughout a Bach cycle. I was surprised how little there is reverberation in this recording. On the other hand the sound is very clear. The music (Fugas BWV 575 & BWV 577 + random chorales) doesn't seem to be best Bach. Anyway, I don't regret spending 2 euros for this disc. P.S. Got to love the cover art of this series by Camille Graeser! there is more exciting stuff ahead! I bought volumes 9-16, two euros each. I'm sure there is very interesting stuff ahead. 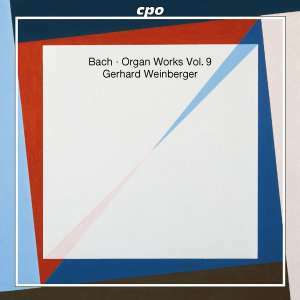 Okay, I have listened Weinberger's volume 10 twice. Much better than volume 9! Now there's just the right amount of reverberation and majesty in the sound. I was surprised how little there is reverberation in this recording. On the other hand the sound is very clear.